Do your kids love to swim as much as ours do? Summer is coming, and whether you’re camping near a lake, the ocean or a pool, time spent in the water is time well spent. But it can also lead to a big mess in your RV! 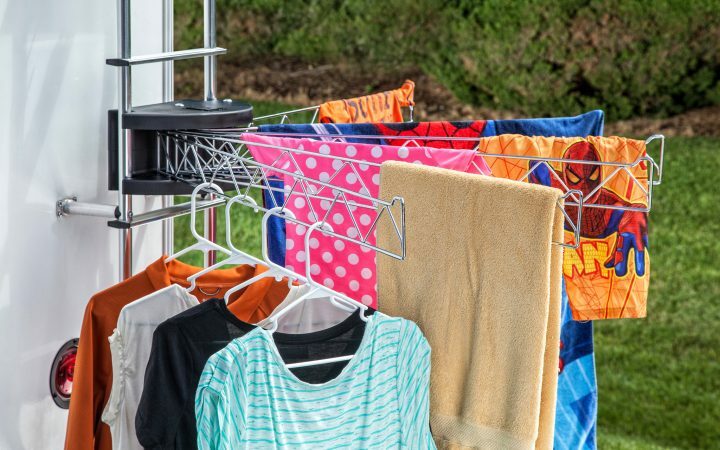 Wet, bathing suits, rash guards and life jackets can end up hangingto dry over every surface in your trailer or motorhome. Worse yet, they can end up on the floor. 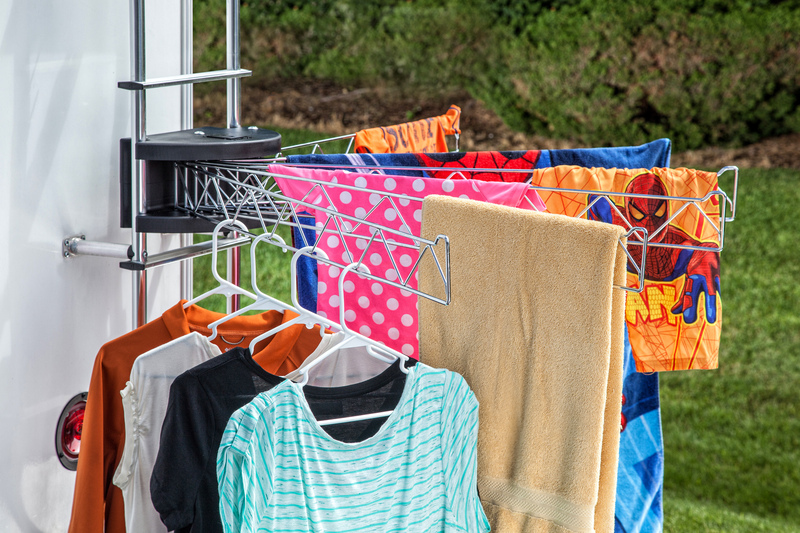 Last summer, we decided to tackle this problem by buying an inexpensive drying rack from one of the big box stores. But the weight of our wet stuff crushed it before our vacation was over. Since then, I’ve been shopping for something sturdier—and now I’ve found it. 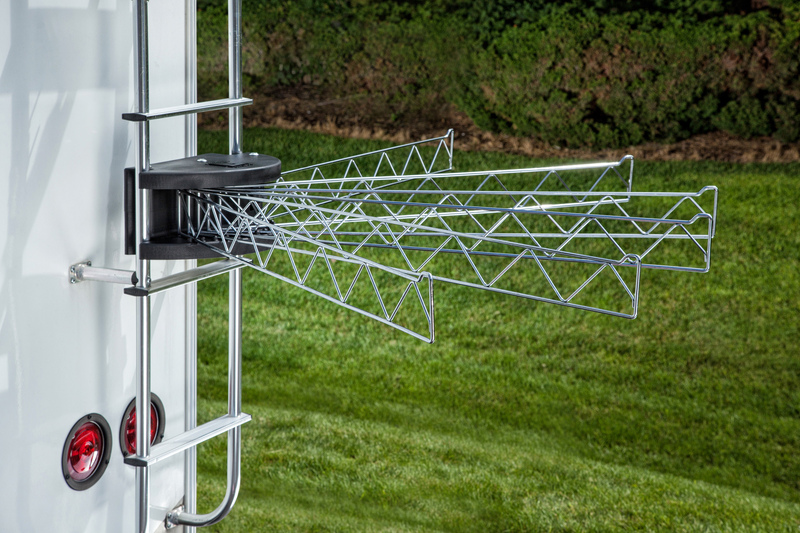 The new Extend-A-Line by Stromberg Carlson has been the perfect solution for our family’s wet and messy problem. We recently spent a week at a campground in Myrtle Beach and we gave the Extend-A-Line a thorough workout. It was incredibly easy to install and even easier to use. 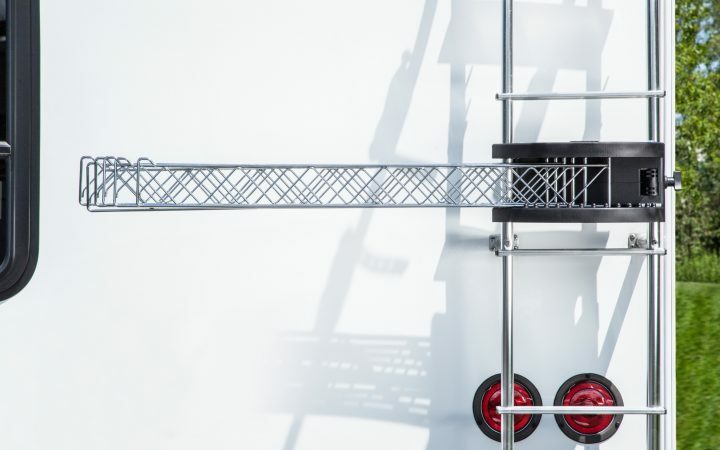 This nifty product mounts to your RV ladder in seconds, and it comes with a wall-mounted bracket for use on a popup camper or for use at home. It has six independent arms that are 42 inches long. Each of them can hold up to 10 pounds. We piled our wet towels and bathing suits onto those chrome plated arms and they did not bend. Not even close. We also really liked how the arms folded flat against the camper when the Extend-A-Line was not in use. 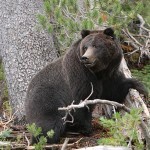 We didn’t have to worry about one of our boys running around the corner of the RV and crashing into it. 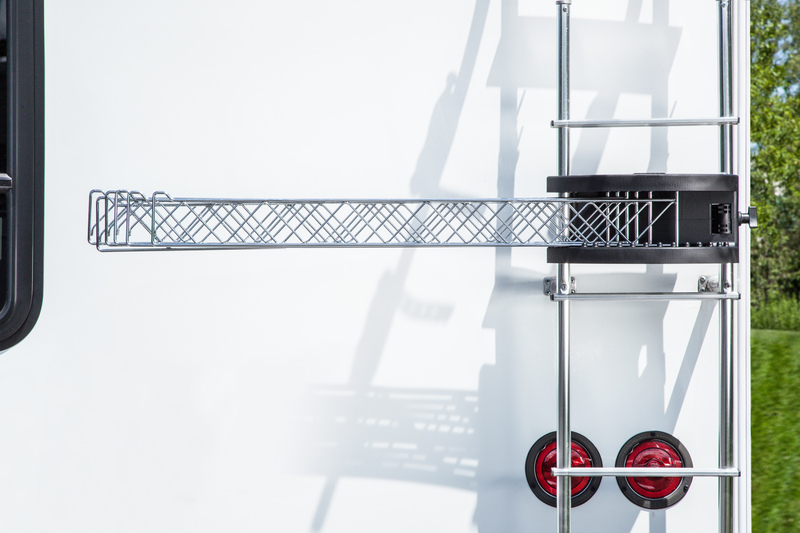 We loved just about every aspect of this product and we think it will last for years. If you have the space to store it, and you have kids that love to swim, surf, or kayak, then it may be perfect for your family. If you get those wet towels off the couch and onto the Extend-A-Line you’ll spend less time cleaning up and more time at the pool. Isn’t that the point of an RV Vacation—fewer worries, more fun? Stephanie and Jeremy Puglisi are the co-hosts of RV Family Travel Atlas, a weekly podcast that is available for free on their website and in the iTunes store. They have also presented seminars about RV Travel for GS Media and Events. 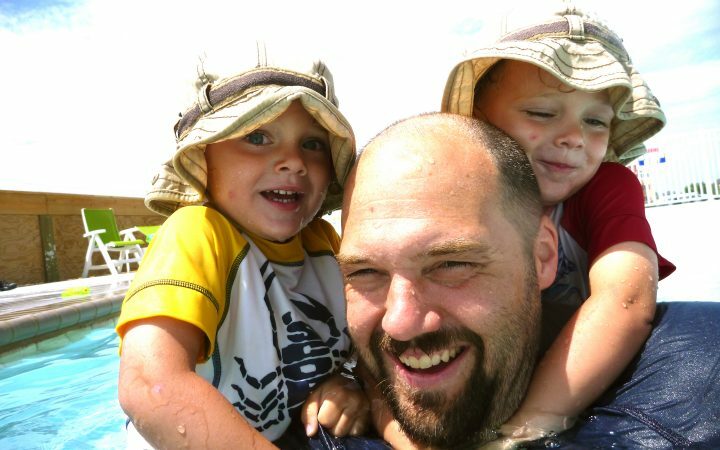 They are passionate about RVing with their three young boys, Theo, Max, and Wes.